The interaction between research, policy and practice in local development is of major interest and LDnet organised a special session on this theme at the annual conference of the RSA in June 2018 in Lugano. One of the panellists in this debate Dr Nicola Francesco Dotti is the editor of a new book making a major contribution on this issue. This new book provides theories, experiences, reflections and future directions for social scientists who wish to engage with policy-oriented research in cities and regions. The ‘policy learning’ perspective is comprehensively discussed, focusing on actors promoting ‘policy knowledge’ and interaction among different stakeholders. 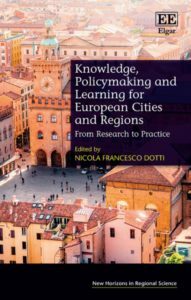 The book also aims to provide practical insights for policy-makers and practitioners interested in research-based approaches to cities and regions. A presentation of the book and discussion took place on 28.11.2018 in the House of Cities, Municipalities and Regions in Brussels. For the introductory presentation, including key points and the table of contents click below.